Unlike salmon, rockfish do not survive well after catch and release. Because of this, there is no size limit for rockfish. Keep what you catch and move to another area if you have reached your rockfish limit. Many species of rockfish live to be over 100 years of age. In B.C., yelloweye and quillback rockfish have been aged to 118 and 95 years old, respectively. Rockfish give birth to live young, after a one to two month gestation period. Inshore rockfish are readily caught using baited hooks and artificial lures. This means that they are very susceptible to over-fishing since the majority of fish hooked and released do not survive. There are 102 species of rockfish worldwide; about 38 of these live in B.C.’s waters. Inshore rockfish live on rocky reefs and do not swim far from their home reef. Red snapper and rockcod are common names used to when selling many species of rockfish, including yelloweye and quillback. There are 37 species of rockfish that are caught in fisheries off the coast of British Columbia. Inshore rockfish species (which include yelloweye, quillback, copper, china, and tiger) are usually caught with hook and line gear in rocky reef habitats. Monitoring and research programs in B.C. indicate that inshore rockfish, especially within the inland waters of Vancouver Island, are at low levels of abundance. Fisheries and Oceans Canada (DFO) needs your help to protect and conserve inshore rockfish. 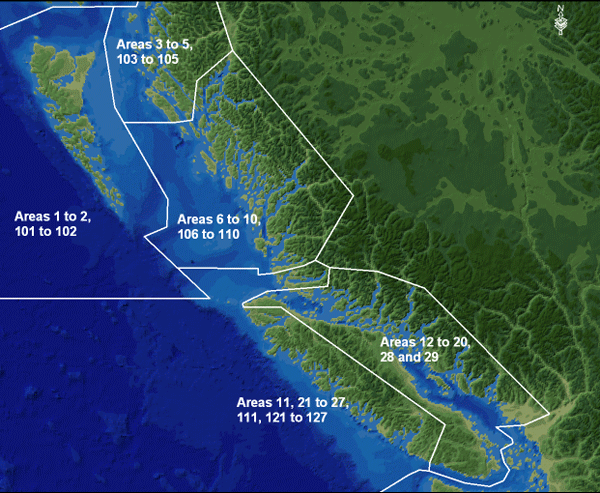 Since 2002, catch restrictions, fishery monitoring, stock assessment programs, and Rockfish Conservation Areas (RCAs) have been established throughout the B.C. coast. DFO’s rockfish conservation strategy is designed to alleviate further rockfish population declines. Within RCAs, inshore rockfish are protected from all mortality associated with recreational and commercial fisheries. Fishing activity not listed below is restricted.